In this Article we will discuss about Concept of Supply : Introduction, Definitions, Determinants, Law of supply with diagram and assumptions. We also discuss that why supply is important and study about positive or direct relationship between price and supply in the market. Supply is a fundamental economic concept that determines the price in the market. Supply of a commodity refers to the quantity of product which seller is willing and able to sell at a given price and time. Supply is always expressed with a particular price and time of commodity. The Price of the commodity and its quantity supplies is directly or positive related. 1). According to Meyers : Supply may be defined as a schedule of the amount of the product that would be offered for the sale at all possible prices at any one instant time, or during any period of time-band the condition remains same. 2).According to Anatol Mirad: The quantity supply defined as the quantity of a commodity offered for a sale at given price and a given time. Price of the commodity: An increase in price will induce an increase in the quantity supplied. elastic. If the time period is short and the supply cannot be expanded after a price increase, the supply is relatively inelastic. Price of related goods : For purposes of supply analysis, related goods refer to goods from which inputs are derived to be used in the production of the primary good. Technology: Technological improvements help reduce production cost and increase profit, thus stimulate higher supply. The Law of supply states that “Other factors remains constant, quantity supply of a commodity is directly related to the price of the commodity.”In other words, when the price paid by the buyer rises, then supplier increases supply of that commodity in market. It means when the price of a commodity is higher, then is supplier is ready to supply higher commodity or vice-versa. The law of supply directly varies with price, if price of a commodity falls its supply will contract, if price raise its supply extends. According to S.E.Thomas, “A rise in price tends to increase in supply and falls in price tend to decrease in supply.” If price of X increases supplier increases supply of X commodity or vice-versa. No change in price of factors of Production. No change in firm goals. No change in seller’s future expectations. No change in price of other goods. Concept of Supply : Introduction, Definitions, Determinants, Law of supply with diagram and assumptions. The given schedule shows the positive relationship between price and quantity demanded of a commodity. When the price is 10 its quantity supplied is 10. As the price increases to 30 , quantity supplied also increases to 30. So, the above schedule shows the direct relationship between price and its quantity supplied. 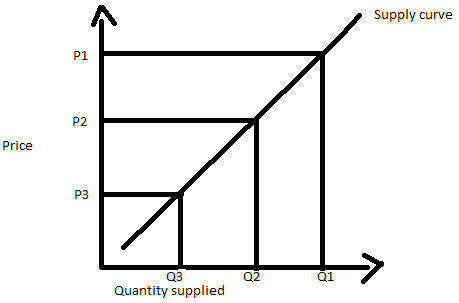 This supply curve shows the positive or direct relationship between price and supply. When the price is 10 supplies also 10 and when price increases to 30 its supply also increases to 30 and vice-versa. In this case when price of the product increases and its supply also increases and shows positive relationship. So we have studied Concept of Supply : Introduction, Definitions, Determinants, Law of supply with diagram and assumptions. and if you have any query please let us know in the comments section.